My Place is a portable free space-analyzing software designed to detect lost space on your system and save storage space. My Place is a program that can help optimize the used space on the hard disk of the WINDOWS user's computer. When you buy a new hard drive, most of us usually look for the folder with the largest storage capacity after some time, as everyone knows that within a few months there is no space available for no apparent reason. My place can help you find the space wasting on your computer so you can remove super large files and folders and win new free space. Please always use ► ... the latest version of the portable free storage analyzing software ! (Image-1) Open a drive of folder in new tab window! My Place is a portable free space-analyzing software designed to detect lost space on your system and save storage space. Mein-Platz, literally meaning "My-Place", is a fast and smooth software that scans your computer for lost space. It scans your computer and then lists the files and folders along with the space they occupy. 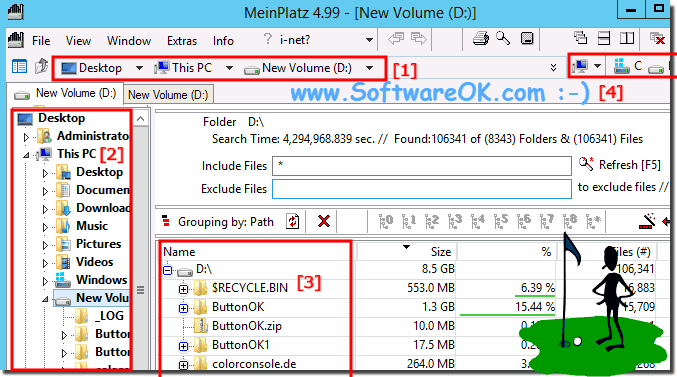 MeinPlatz - FAQ-5: Why search and find lost space on hard drives for Windows?